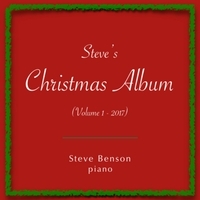 An album of original solo piano recordings of traditional Christmas carols ... some reflective, some cheerful, some introspective, some jazz oriented. Recorded on a Steinway B piano in the artist's personal studio in October, 2017. This CD is, in a way, a musical autobiography. There are so many things in my life that have a part to play in its creation, starting with my grandparents who met through Methodist hymn singing, my mother who is still a whiz ragtime piano player in her 80's, and my education at colleges and later as a personal student of a master of the French Academic training, not to mention years of playing organ and directing choirs for churches. Christmas carols have always been a favorite part of my musical life. In my arrangements on this CD all of these things come together, the love my grandparents found, the keyboard skills my mother passed on to me, the rules of good composition and more importantly learning when to ignore them, and the endless beauty of my beloved Steinway piano. I hope you enjoy listening to these carols as much as I enjoyed playing them. "I fondly recall the fun Steve was able to infuse with the piano, especially as pieces took shape in my mind and the resulting confidence that grew out of them. This balance, of course, was not fully realized until I looked back years later and realized not only Steve's innate musical talent, but his ability to communicate it with enthusiasm." -- Chris W.
altered state of consciousness. Steve has the ability to play hymns, service music, preludes and postludes in a sensitive as well as dramatic fashion..." -- Howard K.
"Steve is an exceptionally talented musician, both as an organist and a pianist. His beautifully varied accompaniment of hymns and the way he both supported and led the singing of the liturgy has been widely appreciated." -- Renata E.
This album is definitely a wonderful gift for anyone in Christmas! It brings the familiar songs to the house with a different touch. Some with sprinkles of water, some with silk threads, some with very soft snow that you would want to fall in, each time when you think the flow will go as unchanged it always comes with a joyful surprise. Listen alone, Listen with your children or listen with your family, no matter how you enjoy it will bring you into a world that you won't forget. A breath of freshly fallen snow! This album is exquisite! Sound, artistry, execution. I love the creative license Steve takes with melody and harmonization. His rhythmic playfulness is contagious; lending a fresh look to tunes so familiar to many. In some cuts, Steve digs in with a passion and musicality which is real and refreshing-not canned or wooden. I’m not sure which is my favorite yet but “Go Tell It On The Mountain” is definitely one. I’m so glad to have this at the ready as my holiday “go-to” de-stressor.